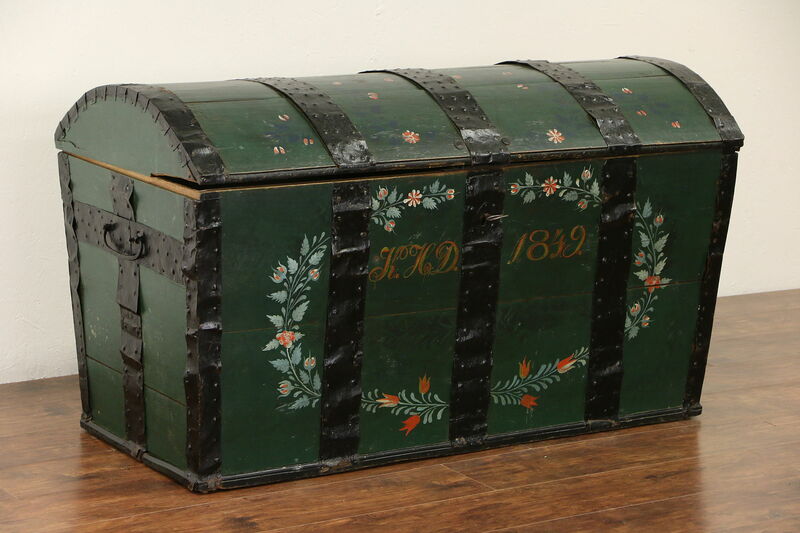 A spectacular immigrant trunk or blanket chest was hand hewn of solid oak in Scandinavia, hand painting is similar to rosmaling, and bears the date "1849." The original giant iron lock and key still work on this European antique furniture. Wrought iron mounts are original, corners have hand cut dovetail joints. The artistic folk art painting has been preserved and protected with a coat of satiny varnish. Dimensions are 53" long, 25" deep and 30" tall. See 22 photos on Harp Gallery website that enlarge to full screen size.